We were curious to know how many websites had implemented fundamental SEO elements correctly on their home pages—arguably—a website’s most important page? If there are 141 million active websites, our focus is on the 99% of sites (the bottom 139.6 million) that don’t have dedicated SEO experts, but who nonetheless, have websites and do worry about their inbound traffic, or lack thereof. To help us acquire the big-data set and help us make sense of the results we teamed up with online-behavior engineering quants at OBTO Tech. Pinging 1 million websites takes some tricky coding and smart planning. Obviously, you want to get it right the first time so you don’t have to start all over again after you’ve already analyzed 750k sites. In case you want to do your own research, here’s the Alexa 1 million site file we used (.csv format, as compressed .rar file, 9M download). 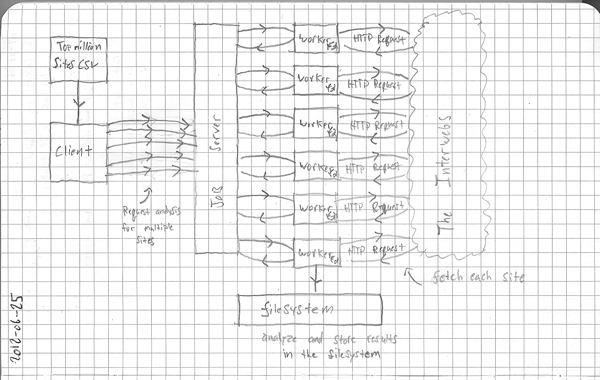 To keep costs and complexity to a minimum, OBTO Tech used a single server to ping the 1 million sites. However, given the latency of website (HTTP-request) response times, their calculations showed that it was going to take a very long time to complete our research. To speed things up, Gearman was used to implement a basic map/reduce system: Map: Several threads were created to reduce the bottleneck of waiting for each HTTP response. Each thread would send one request to the given url, analyze it and store the analysis into the filesystem. Reduce: Each thread would grab a range of the stored analyses (site 1-100) and send back the compiled report to the main Gearman worker. 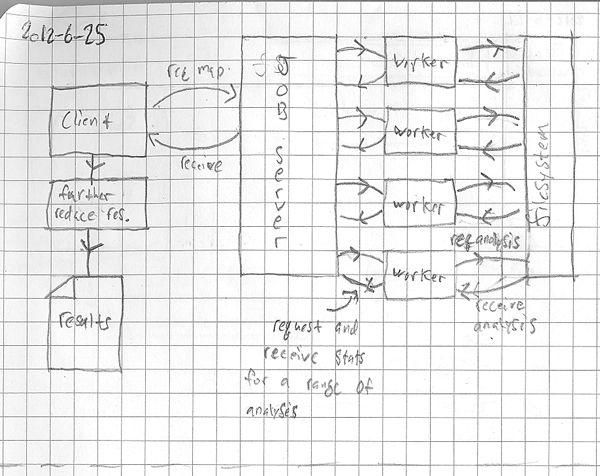 See hand drawn sketch of the map/reduce system, below. The entire project took about three days to complete.